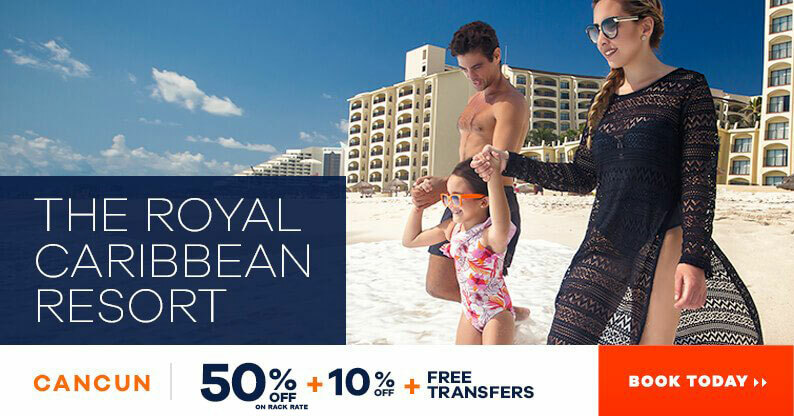 Cancun beaches are within your grasp with our travel combo with an amazing 50% discount plus an additional 10% on rack rate when booking the suite of your choice at The Royal Caribbean Resort, plus get free roundtrip airport transportation. Start living dreamy days in the freedom of the ocean landscapes and white sand dunes, chilling out, swimming, kayaking, or simply enjoying your favorite cocktail down the shade of a palm tree. Our beautiful beachfront resort is ideal for families and couple yearning for a peaceful getaway. Besides, the perfect scenario in Cancun holds not only our pristine paradise, but many other interesting places and attractions, such as theme parks, nightclubs, aquariums, restaurants and much more. Enjoy impeccable, facilities, services and top-notch amenities at The Royal Caribbean All Suites Resort with Royal Reservations. This promotion includes a free roundtrip airport transportation (airport - hotel - airport) per person confirmed in your confirmation letter. Service will be provided in shared service. The transportation service is available for flights arriving from 5am to 11:59pm & flights leaving 7am to 9pm. Service must be confirmed at least 48 hours before arrival, otherwise will not be possible to guarantee. This promotion does not include meals or drinks. "I have had our Time Share at RC. And You can count on Royal Caribbean for the last 25 years for top quality. My children and now grandchildren have grown up there. I especially like the breakfast buffet and the pools. Plus the extras for free like tennis, sailboats and Kayaking." "Beautiful scenery. Easy service, there is a mini grocery store, spa, excursion service, beautiful pool with a bar.... Just really awesome! 2 thumbs up!" "The location was great, and the cleanliness was the best. Our stay at the Royal Caribbean was one of the best experiences we have had in a long time. Everything was excellent. The ocean view room was great"